students | Teacher. Reader. Mom. So…I’m weighing in. On the bubbles. And the #2 pencils. My views on this exercise in futility are in line with Rachel’s (not much of a surprise, I know). Two weeks of ISAT testing (the Illinois version of standardized tests, known as THE TEST in Chicago) is mind numbing, frustrating, exhausting. But , in truth, I am growing a bit weary of the constant critique of standardized testing without an equivalent effort towards generating viable alternatives for measuring student learning and teacher accountability. But I suppose we need to figure out what’s broke in order to fix it. So here’s what I think about the bubbles. THE TEST pisses me off. Just so you know where I stand. All eyes would turn toward me, albeit briefly, and a hush would fall over the room. And I would feel HORRIBLE, and I would think, “I have become a bad teacher.” In truth, I used THE TEST ploy more often than I care to admit. I had learned that my students (and their parents) had been conditioned to believe that the ONLY things we learned that were important were those that were on THE TEST. And sometimes, I wasn’t sure if the problem we were solving or what we were learning or working on together would actually be on THE TEST But I said it anyway, because I knew, sadly, that THE TEST would clothe the concept or skill with gravity and importance in my student’s eyes. I had approached teaching with the idea that THE TESTwas not supposed to be the focus – authentic learning and teaching intermingled with social justice – that was the focus. I figured if I developed and effectively taught engaging and meaningful curriculum that covered the state learning standards (Yes, I kept a checklist), my kids would perform well on the state tests. My own assessments (formal and informal) would tell me if the kids were getting what I was teaching. Assessment is an integral component of instruction. But then, the bean counters showed up, claiming to be able to NUMERICALLY QUANTIFY what my kids were learning and how well I was teaching (Ah, yes: ADDED VALUE) and whether my school was worth keeping open. Okay, the bean counters were there when I started teaching in 2005, but somehow, their voices grew LOUDER and their power and influence seemed much greater as the years passed. I think it was because they were shouting at the top of their lungs: ‘DATA DRIVEN INSTRUCTION!’ Which means many things to many people. Over, time, It became impossible for me to shut them out. Especially when the fate of our school (probation? closure?) was ruled by the counters, the beans (the data or test results) and how, exactly, they were counted (or construed). So meeting after meeting, teachers and administrators pored over and disaggregated data (mind you, it was 6 months old). We were precise – we were going to use this data to increase profits – whoops – raise achievement by analyzing this data and build – whoops – target instruction for each and every widget – whoops – student. I BEGAN TO HATE DATA. 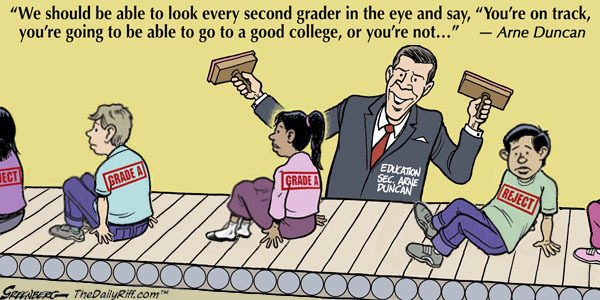 In truth, it doesn’t tell you a damn thing about the students, their real progress or their potential. Generally, it never takes into account who these kids are or where they’ve been academically or emotionally. In my experience, THE DATA overall lacks context. But I succumbed to the pressure to “get my kids ready” for the state test by dutifully using the “interim assessments” doled out by the district which would ensure we would get our kids on track to do well on the test. Never mind that these interim assessments were not, in educational parlance, “aligned” with what I had been teaching in my classroom. The results of these assessments: more DATA. In a flash, we were assessing kids monthly, sometimes weekly. Bell-ringer math tests that were reviewed by the administration to assess student recall of math facts. Dragging students to the computer lab (which was almost never available otherwise) to complete ridiculous assessments: long, contrived reading passages followed by multiple choice questions. Practice, Practice, Practice. My 8th grade boys one year figured out that if they answered the questions for a passage INCORRECTLY, the test ended. And yes, they knew what they were doing. Suddenly, kids who were reading at or above grade level seemed barely literate. I was chastised (not by my students) for not emphasizing the importance of the so-called interim assessment. It was my job to sell it to them. And all I kept thinking was just how smart and clever those guys were for thinking outside the bubble. Standardized testing with high stakes (the fate of students, schools and teachers) is, in my view, preposterous and extravagant. And yet, we continue to engage in this exercise year after year in our public schools, with a perplexing emphasis on those schools where student populations live in poverty and amidst life-threatening violence. Yes, it is essential to know what our kids know and don’t know after a year of instruction (although ISAT tests were administered with roughly A THIRD of the school year remaining). Sure, it is important to objectively assess kids and examine the data in a timely fashion to see if they are learning what we are teaching – and so we can figure out what to do when they are not learning. BUT should a school’s future – a kid’s future – really ride on how well they perform on a multiple choice test on a given day? How reliable is this data? How timely is this data? What does this data tell teachers? Administrators? Especially after it is massaged by the bean counters and provided to teachers months later, and sometimes well into the following school year. 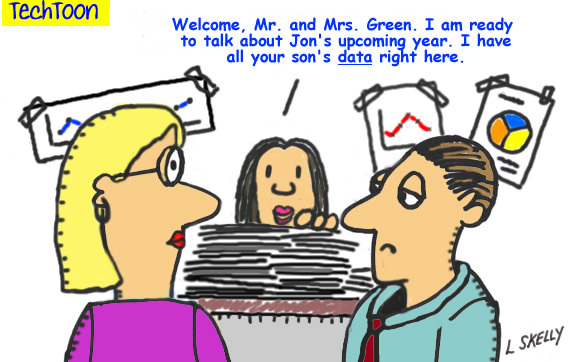 THIS TYPE OF DATA – FOR TEACHERS – IS OF LITTLE VALUE. Loss of Instructional Time: Assessment and prep take time out of the learning day. No way around it. The minutes beforehand to get our kids to focus on the assessment and the minutes after to get them to regroup after intense concentration. Valuable time. I’m not talking about classroom assessments – I’m talking about the standardized test assessment practice to “gauge” levels of performance. Oh – and generally, state assessments eat up at least a full week of instruction. No, I’m not kidding. Even allowing restroom access is a big deal during state testing. And as Rachel points out, our neediest kids who are pulled out for one-on-one time for learning and social/emotional support are neglected during these testing days (often because the specialist teachers who are pulling students out are proctoring tests). A Narrow Focus: As I mentioned above, my students had previously determined that if it wasn’t on the test, it wasn’t worth spending time on. I did my best to dissuade them and worked to keep them curious, applauded their questions, and celebrated their learning successes – with the purpose of cultivating life-long learners. Filling in bubbles is boring, after the initial adrenalin rush (kids are naturally competitive for the most part). I think it is our job as educators to reward curiosity and awaken the imagination of our kids. An overemphasis on multiple choice tests requires our students to think in, rather than outside of, the box (or bubble). Increased Stress : The pressure on students is ENORMOUS. They are carrying the weight of their own future (“Will I meet standards? I better exceed standards!”) and often the fate of their schools and teachers. I’ve written about my kids who throw up, cry uncontrollably, or start a fight to get out of the testing room. Anxiety is high because it should be. The test matters. And for kids who are living and surviving in high stress homes and neighborhoods, the test can be the straw that breaks the camel’s back. 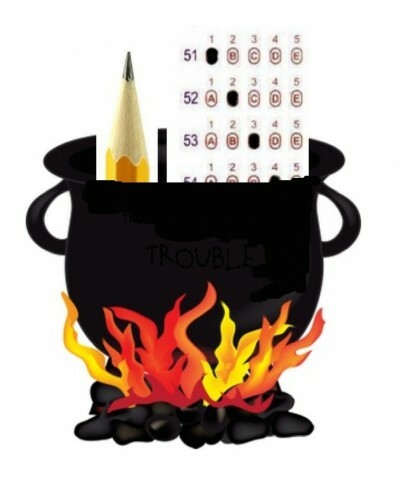 Internalized Failure: NEWS ALERT: NOT EVERY STUDENT WILL MEET STANDARDS BECAUSE OF THE NATURE OF THE TEST ITSELF. In Illinois, the test is a combination of norm-referenced and criterion- referenced items (ISAT 2013 guide) which are used in a mysterious formula (guarded like the gold in Fort Knox) to determine whether students “meet” standards. Norm-referenced tests are comparative (comparing the test taker to a group of peers) and thus a certain portion of students will fall at the lower end of the bell curve (failing to “meet” standards). I’ve often wondered who this group of peers might be when testing inner-city kids. As Rachel noted, the test passages can be pretty white, with middle-class scenarios. My favorite one had an illustration of a camper and a campfire and one of my students was concerned about why people were living in a bus in the forest. I made a note of going over campers the following year when I was getting my students prepared for the test. I have digressed. My point is this: some students will always struggle and after failing to “meet” standards in 3rd and 4th grade, well, they give up. 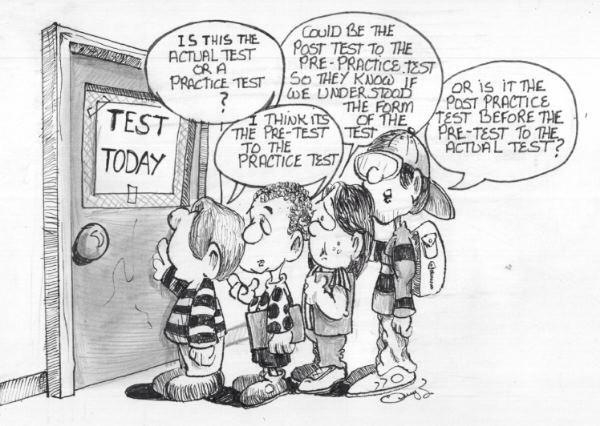 It takes a lot of coaxing and cajoling to get some kids to even fill in the bubbles on the test. Kids who think they are academic failures are generally the kids we lose by the time they get to high school. The Numbers Game: It takes a while for test scores to be calculated and calibrated. Really? Don’t let anyone kid you about the ease of standardized test scoring. They don’t just run these scoring sheets through a machine and spit out the scores. These beans are so important (in terms of education dollars) that districts spend months analyzing the outcomes and work to produce the best possible outcomes (eliminating test items, etc.). Also, schools get points for kids who meet standards and extra points for kids who exceed standards. Except, much of the time, administrators who are pressured heavily from above, push teachers to focus on the groups they can “move.” If kids are certain to be below standards, they can be gently set to the side while we work on beefing up the scores of other kids. This is not education. This is not Social Justice. It’s a racket. Here’s an interesting pro/con standardized testing discussion to look at BOTH SIDES of the debate: Testing Arguments if you aren’t sure where you stand on the issue. Me? You know where I stand. A system of bubbles is fraught with trouble. I think it is time to turn the energy away from the debate and toward a solution: an authentic system of teaching and learning accountability developed at the school level. Let’s stop trying to create widgets and, instead, work to foster thoughtful thinkers, mindful humans and world changers. I have been working for the past few hours on a really long post about my feelings about standardized tests. It’s been cathartic, but I can’t imagine anyone will read it all the way through. And I’m only on my first point. It’s so frustrating to have to explain with evidence why I so strongly despise standardized tests. Not that I don’t enjoy doing the research to justify my opinions. But I find that the students in front of me tell much better stories than the journalists at Newsweek. My job these past two weeks has been to administer tests. Five a day. It is absolutely mind-numbing. I don’t think this child will pass the test. Mostly because he doesn’t really see the purpose in taking the test seriously. To his face, I remind him how important this test is to his grades, his teacher, and our school. I can’t say I believe I changed his mind on the matter. Probably because those words ring false, even to me. The kid is pretty much too smart to do well on the test. I watched several students in each grade have complete melt downs during the test. Tears streaming down ten year old cheeks as they fear that they do not have what it takes to answer the questions. Instead of trying and getting the answer wrong, they sit and take the failing grade of a blank paper. Perhaps more heartbreaking is the eager child who looks to me with unguarded desperation for approval. “Did I do good on the test? Did I take my time? Did I do what I was supposed to do?” So eager to please me. Completely unsure of themselves without the gold star, the test score, the pat on the back. Because approval has always come from without, not within. I think I’d rather have the student who had the audacity to look me in the face and tell me the test is an abomination. I hope I’m the kind of teacher who rewards such divergence of thought. In kindergarten time, two weeks means you may as well start over from the beginning. Two weeks is eternity. I have a job. And most days I love it. But not on the testing days. Not on the days that I see the kids, the ones I’ve spent months trying to get to ask questions, to react to the world around them, to wonder why it matters that there was an Underground Railroad, that Rosa Parks wouldn’t sit down on a bus, that their city is so violent, that there are wars going on right now in other parts of the world… The kids I’m trying to encourage to THINK for themselves, spend two weeks trying to ascertain the answer that some test-taker has in mind for them to find. On the test today one of my students said, “Ms. Swanson, is Abby a girl or a boy?” He was writing about a math test question and wasn’t sure of the pronoun to use when referring to Abby. I felt that summed up the relevance of this test. And the hurdles my almost exclusively non-white students have to overcome to do well on them. Abby is a girl, sweetie. I’m sorry I didn’t make a poster for the wall about the white names you may encounter while taking the test. It’s simply exhausting. It’s so frustrating. And I’m really happy tomorrow is Friday and it’s almost over. Just in time to prepare for the next round of testing. Just Breathe: Meaningful “Value” Added & Higher Standardized Test Scores in just 8 minutes/day! Wouldn’t it be great if that were truly the case? If, in only 8 minutes per day, a teacher could transform students into amazing test-taking machines, the rest of the day could be spent learning valuable curriculum. Unfortunately, there is no one “strategy” or “tip” that will result in such a magical transformation. And the stress of test prep for both teachers and students increases every day of the school year until the tests are completed and sent off to be scored. Let’s not mention the stress of waiting for the scores to be reported. I always tried to ignore the nudging and cajoling from my administrators to focus on standardized test prep for my students as the test loomed closer, especially after returning from winter break. Sure, test prep helps, sort of. I guess. But the more we focused on how to “Do your best! 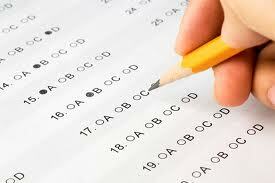 It’s THE test!”, the less my students focused on learning. Instead, many of them, including my stellar performers, began to stress out. A LOT. This did nothing to improve test scores, my value-added score or the quality of life in our learning community. My dear friend Nancy, an amazing yoga teacher who was helping me de-stress from my own test anxiety (! ), suggested that I consider bringing some yoga & meditation into my 7th grade classroom and incorporating it as part of our day. I was hesitant at first because there was no room in my classroom to spread out on the floor. And we worked to use it in the classroom the rest of the year – even after the test. As a whole, my students performed well on the math, science and language arts standardized tests we administered every March. Did yoga and meditation help? I can’t prove it – but I know it helped my kids with behavior issues and it was a tool our classroom could use at times when inattentiveness and adolescent distractions disrupted instruction. 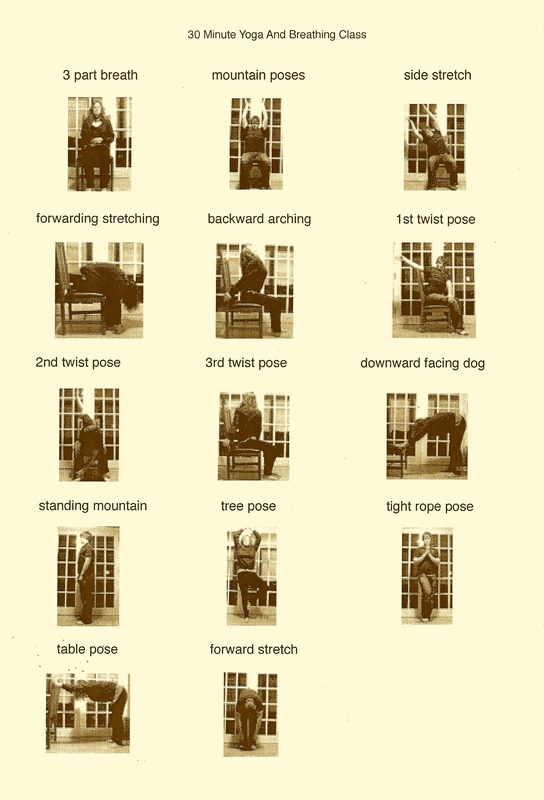 Doing yoga in a chair means kids can sit in their chairs. No need to take time to move and regroup. Like Nike says: JUST DO IT. Current and ongoing research supports the use of mindfulness techniques in the classroom, including meditation and yoga, to help ease tension and depression and to help students attend to instruction. A compilation of these studies can be found at the University of California at Berkeley’s Greater Good website. And take a look at this interesting article (with a video) on the positive impact of mindfulness techniques in low-income schools at the Mind/Shift blog. I incorporated a singing bowl in my instruction for the next several years as a way to quiet students rather than using my voice (which I had been losing somewhere in early February prior to that time). They are beautiful and the kids view it as sacred. One of the best investments I ever made, a singing bowl can be purchased at http://www.Amazon.com (some for as little as $24). 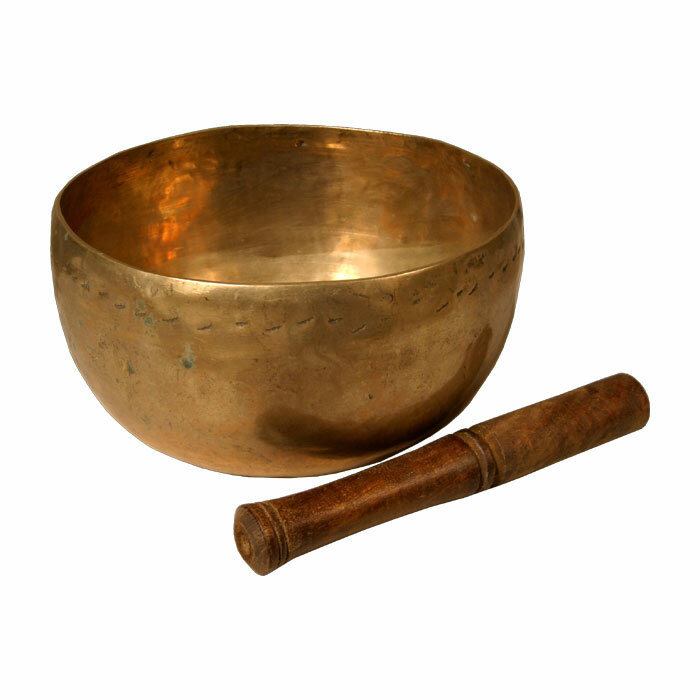 Use the singing bowl as a sign for kids to sit quietly at their desks or come to the carpet to participate in a group activity – such as yoga or meditation – or even guided reading. Even my energetic, often unruly 8th grade boys knew to quiet and even close their eyes when they heard the sound of the bowl. 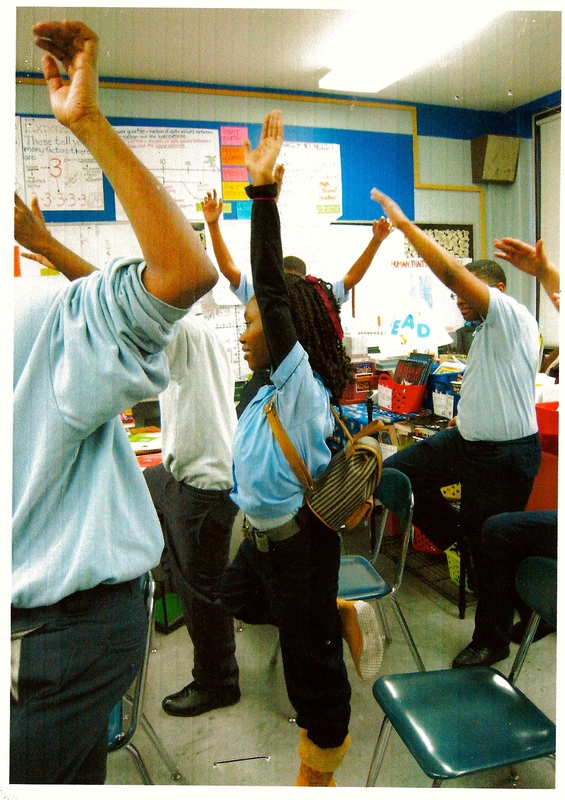 I can attest that my students benefited overall from learning how to use yoga, meditation, and breathing techniques to “de-stress” and refocus in the classroom, especially during the period leading up to high-stakes testing. A holistic approach to preparing our students – mind, body & spirit – to take on difficult learning and task challenges, not just standardized tests, truly adds value to the classroom and to the experience of teaching and learning. Breathe.